Gionee is one of the most trusted brands in China and has become quite popular in India after the acceptance of Elife E3(Quick Review) and Elife E5(Full Review). Today at Gionee’s press event where they showcased Elife E6(Initial Hands On), Gionee discussed its plan to be a top level player in India in next couple of years. Today in this comparison review we will keep both these devices head to head based on specifications to understand how far Gionee has evolved this time with its new Flagship smartphone!! The Gionee Elife E5 comes with a 4.8 Inch Super AMOLED 1280 x 720p HD display with pixel density of 316 ppi which is pretty good and you won’t see any resolved pixels. In our time with the device we experienced wide viewing angles with minimum color fading. The super AMOLED display as expected will provide you with darker darks. The Elife E6 comes with a bigger and better display with 5 Inch size and Full HD 1920 x 1080 pixel resolution. The ppi count has been increased to 441 ppi. The change won’t be as apparent to the naked eyes but there will certainly be a difference. Also this time around Gionee has used IPS LCD technology instead of super AMOLED which is expected to give you a brighter display. The Display in Elife E6 also comes with OGS+ technology which eliminates the air gap between display layers and reduces refracted light to give you good outdoor visibility and improved brightness. In our first impression of the device we found the color reproduction at par with other high end devices like iPhone 5 and Samsung Galaxy S4. The Processor on both of these smartphones is MT6589T which is turbo quad core processor from MediaTek clocked at 1.5 GHz. This processor comes with PowerVR SGX 544 MP GPU which will give you good gaming performance. The RAM capacity supporting the processor has been doubled from 1 GB in E5 to 2 GB in E6 and thus we can expect much better performance from Elife E6. The Elife E6 features 13 MP primary camera which comes with LED flash. Besides increasing the MP count Gionee has optimized the software to give you better shutter speed. The front camera comes with same mega pixel count at 5 MP but the camera lens is a Wide angle lens for better performance. Both the front and back camera are capable of full HD 1080p Video recording. 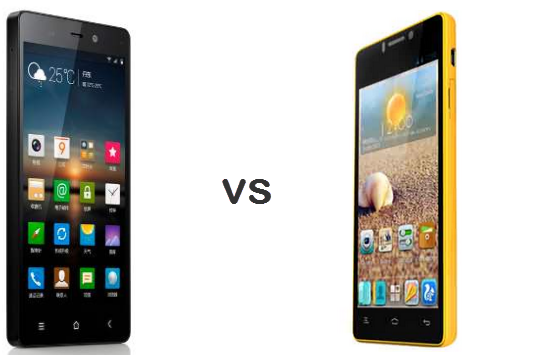 The Internal storage memory in both of these smartphones is not extendable owing to the Unibody design. The Elife E5 provides you with 16 GB of internal storage of which 13 GB is available at users end. The Elife E6 comes with double the amount of storage at 32 GB. Elife E5 sports a 2000 mAh battery which lasted 1 day when with moderate usage when we used the device. Our usage included streaming 1 hr of videos from internet, WiFi usage through the day, playing some high end games and one and half hour of calling. Both the smart phones use Android jelly bean based Amigo operating system. We found the UI transitions little sluggish on Elife E5 as compared to Elife E6. Elife E6 will also come with an intelligent voice feature which will work even without an internet connection. Elife E5 and E6 dont have OTG support. Yes the Elife series has evolved significantly. The body design of Elife E6 looks amazing for a phone priced around 22 K and it does matters. The phone shows improvement in all aspects and is priced only 3,000 above its predecessor. Elife E5 impressed us and we can’t wait to spend even more time with E6. Elife E6 doesnt have OTG support. Yes, thanks for pointing out – it has been corrected now. i cant comment much about it – but considering their build is better than other chinese phones players it should.